When you announce your engagement the first sentence people say is "let me see your ring!" Of course, show it to them and then hit them with the knowledge about your bling! Carat: Diamond carat weight is the measurement of how much a diamond weighs. A metric "carat" is defined as 200 milligrams. Diamond price increases with diamond carat weight, because larger diamonds are more rare and more desirable. 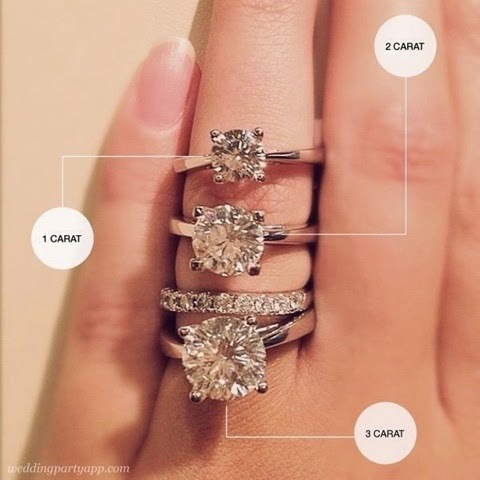 But two diamonds of equal carat weight can have very different values (and prices) depending on three other factors of the diamond 4Cs: Clarity, Color, and Cut. Clarity: Diamond clarity refers to the absence of inclusions and blemishes . Color: The diamond color evaluation of most gem-quality diamonds is based on the absence of color. A chemically pure and structurally perfect diamond has no hue, like a drop of pure water, and consequently, a higher value. Cut: Diamonds are renowned for their ability to transmit light and sparkle so intensely. We often think of a diamond's cut as shape (round, emerald, pear), but a diamond's cut grade is really about how well a diamond's facets interact with light.